Frank Wilton Marshall (born September 13, 1946) is an American film producer and director, often working in collaboration with his wife, Kathleen Kennedy. With Kennedy and Steven Spielberg, he was one of the founders of Amblin Entertainment. In 1991, he founded, with Kennedy, The Kennedy/Marshall Company, a film production company which has a contract with DreamWorks. Since May 2012, with Kennedy taking on the role of President of Lucasfilm, Marshall has been Kennedy/Marshall's sole principal. Marshall has consistently collaborated with directors Steven Spielberg, Paul Greengrass and Peter Bogdanovich. Born in Glendale, California, Marshall is the son of guitarist, conductor and composer Jack Marshall. His early years were spent in Van Nuys, California. 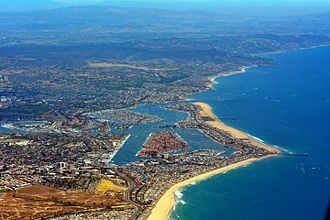 In 1961, his family moved to Newport Beach, where he attended Newport Harbor High School, and was active in music, drama, cross country, and track. 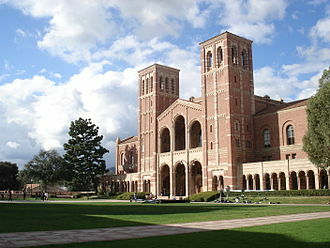 He entered UCLA in 1964 as an engineering major, and graduated in 1968 with a degree in Political science. While at UCLA, he was initiated into Alpha Tau Omega fraternity and he helped create its first NCAA soccer team, and played collegiate soccer there in 1966, 1967 and 1968. In 1966, he met film director Peter Bogdanovich at a birthday party for the daughter of director John Ford, a friend of his father. Marshall volunteered to work on Bogdanovich's first film, Targets (1968), which became his apprenticeship in film production, as he assumed various productions roles, even appearing in a bit part. Following graduation from UCLA, Marshall spent the next two years working in Aspen and Marina del Rey, as a waiter/guitar player at "The Randy Tar," a steak and lobster restaurant. While traveling through Europe in March 1970, he received another call from Bogdanovich, offering him a position on The Last Picture Show (1971). Three days later he arrived in Archer City, Texas, doubling as location manager and actor in this seminal film. Under Bogdanovich's guidance, Marshall would work his way up from producer's assistant to associate producer on five more films. He branched out to work with Martin Scorsese as a line producer on the music documentary The Last Waltz (1978) and as an associate producer on director Walter Hill's gritty crime thriller, The Driver (1978). The following year, Marshall earned his first executive producer credit on Hill's cult classic street gang movie, The Warriors (1979). He continues to collaborate with Bogdanovich, working to finish their tenth film together, Orson Welles' unfinished The Other Side of the Wind. 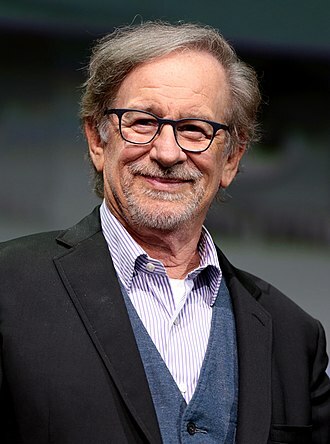 In 1981, together with his future wife Kathleen Kennedy and Steven Spielberg, he co-founded Amblin Entertainment, one of the industry's most productive and profitable production companies. As a producer, Marshall has received five Oscar nominations for Best Picture for The Curious Case of Benjamin Button (2008), Seabiscuit (2003), The Sixth Sense (1999), The Color Purple (1985), and Raiders of the Lost Ark (1981). His feature film directing debut was the thriller Arachnophobia (1990), starring Jeff Daniels. In 1991, he and Kennedy created The Kennedy/Marshall Company and began producing their own films. Marshall directed the company's first film, Alive (1993), about a rugby team struggling to survive in the snow after their plane crashes in the Andes. Next, he directed Congo (1995), based on Michael Crichton's novel, followed by Eight Below (2006), an adventure about loyalty and the bonds of friendship set in the extreme wilderness of Antarctica. In 1998, directed the episode "Mare Tranquilitatis", from the Emmy Award-winning HBO miniseries From the Earth to the Moon. As part of ESPN's 30 for 30 series, Marshall directed a documentary about Olympian Johann Olav Koss entitled Right to Play (2012). (the name of Koss's humanitarian organisation). Marshall stated that the documentary, broadcast in 2012, sought to capture not only Koss' sporting career and the ideals behind his nonprofit organization, but also his "drive and how it has changed the world." From 1991 to 2012, The Kennedy/Marshall Company produced many films, including The Sixth Sense, Signs, Seabiscuit, The Curious Case of Benjamin Button, War Horse, Lincoln, the Bourne series and the feature documentary The Armstrong Lie (2013). Since taking over as sole principal of the company, Marshall has broadened its slate beyond feature films to include television, documentaries and Broadway musicals. Recently, he produced the Emmy Award-nominated documentary Sinatra: All or Nothing at All, which premiered on HBO in April 2015, and the summer blockbuster Jurassic World (2015), which has become the third highest-grossing film of all time. 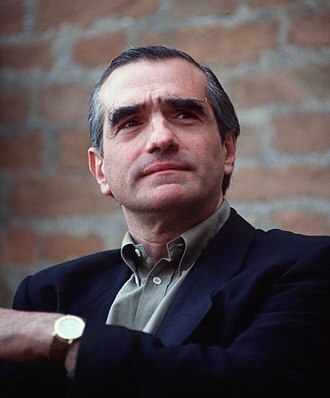 During the 1980s and 1990s Marshall served on the advisory board of the National Student Film Institute. Marshall is a former VP, member of the board of directors and member of the Executive Committee of the United States Olympic Committee (USOC). He was awarded the Olympic Shield in 2005, and inducted into the U.S. Olympic Hall of Fame class of 2008 for his years of service to the USOC. Currently, he serves on the board of Athletes for Hope, Governor's Council on Physical Fitness, and as Board Chair of the US Center for SafeSport. In addition to his service to sports organizations, Marshall is also involved in the educational arena, serving as a board member of LA’s Promise Fund, as a trustee of The Archer School for Girls, and on the UCLA Foundation Board of Governor's. He is a recipient of the American Academy of Achievement Award, the UCLA Alumni Professional Achievement Award and the California Mentor Initiative's Leadership Award. In June 2004, Marshall gave the Commencement Address at the UCLA College of Letters and Science graduation ceremony in Pauley Pavilion. Marshall has long enjoyed magic and music and has been known to perform under the moniker of "Dr. Fantasy" or "DJ Master Frank". Combining his passion for music and sports, Marshall and America's premiere miler, Steve Scott, founded the Rock 'n' Roll Marathon, which debuted in 1998 in San Diego as the largest first time marathon in history. ^ "The Kennedy/Marshall Company – About", The Kennedy/Marshall Company. Retrieved 2012-10-02. ^ UCLA Bruins: Where are they now? ^ a b Zeitchik, Steven (June 10, 2009). "Spreading the good-sport word". The Hollywood Reporter. p. 5. Archived from the original on June 13, 2009. Retrieved September 6, 2009. 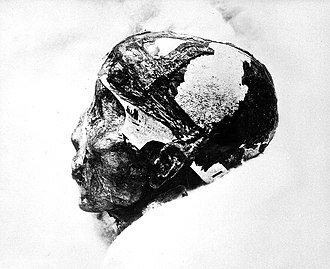 ^ Hopewell, John; Keslassy, Elsa (5 June 2012). "GKIDS plants N. American flag on Poppy Hill". Variety. Reed Business Information. Retrieved 6 June 2012. ^ "The Wind Rises: About Page". Tumblr. Archived from the original on January 7, 2016. Retrieved May 1, 2014. ^ Amidi, Amid (2014-03-12). "GKIDS Acquires Takahata's 'The Tale of The Princess Kaguya' for U.S. Distribution". Cartoon Brew. Retrieved 2014-03-19. Wikimedia Commons has media related to Frank Marshall. DreamWorks Pictures is an American film production label of Amblin Partners. It was formerly distributing its own and third-party films by itself and it has produced or distributed more than ten films with box-office grosses of more than $100 million each. As of October 2016, DreamWorks films are marketed and distributed by Universal Pictures, DreamWorks began in 1994 as an attempt by media moguls Steven Spielberg, Jeffrey Katzenberg and David Geffen to create a new Hollywood studio of which they owned 72%. Currently, DreamWorks operates out of offices at Universal Studios, in December 2005, the founders agreed to sell the studio to Viacom, parent of Paramount Pictures. The sale was completed in February 2006, in 2008, DreamWorks announced its intention to end its partnership with Paramount and signed a $1.5 billion deal to produce films with Indias Reliance ADA Group. Reliance provided $325M of equity to fund recreating DreamWorks SKG into DreamWorks Studios, after the formation of Amblin Partners in 2015, the studio entered into a distribution agreement with Universal Pictures. DreamWorks animation arm was spun off in 2004 into DreamWorks Animation SKG, which owns the DreamWorks trademarks. Spielbergs company continues to use the DreamWorks trademarks under license from Universal Studios, the original company was founded following Katzenbergs resignation from The Walt Disney Company in 1994. Katzenberg approached Spielberg and Geffen about forming a live-action and animation film studio, which had not been done in decades due to the risk and expense. 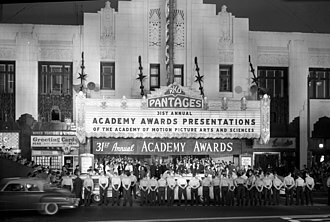 They agreed on three conditions, They would make fewer than nine movies a year, they would be free to work for other studios if they chose, and they would go home in time for dinner. They officially founded DreamWorks SKG in October 1994, with backing of $33 million from each of the three partners and $500 million from Microsoft co-founder Paul Allen. Their new studio was based at offices in the Universal Studios lot, despite access to sound stages and sets, DreamWorks preferred to film motion pictures on location. Usually, the company would film in a soundstage or set in a major studio, as of 2016, DreamWorks is still based in Universal. Walter Hill is an American film director and producer. He is widely known for his films and revival of the Western genre. He has directed such films as The Warriors, Hard Times, The Driver, Southern Comfort,48 Hrs. Red Heat, Last Man Standing and Bullet to the Head, as well as writing the Steve McQueen crime drama The Getaway. He has directed episodes of television series such as Tales from the Crypt and Deadwood. Hill was born in Long Beach, the younger of two sons and his paternal grandfather was a wildcat oil driller, his father worked at Douglas Aircraft as a supervisor on the assembly line. Hill has said that his father and grandfather were smart, physical men who worked with their heads, Hills family had originally come from Tennessee and Mississippi, one of those fallen Southern families, shirtsleeves to shirtsleeves in three generations. Growing up in southern California, Hill was asthmatic as a child and, as a result, what it did for me, despite the discomfort, it made you comfortable being alone with yourself. You werent as surrounded by peers as everybody else your age was. In my case it meant tremendous amount of reading at an early age, I became utterly besotted with daytime serials. In the afternoon, when kids were meant to be home and it enabled me to live in an imaginary world where one is comfortable with abstract ideas, dominated by stories and characters. Hill became a fan at an early age, and the first film he remembers seeing was Song of the South. He described his taste as juvenile, stating, I liked adventure, but the general, I remember not liking kid movies. Still dont, I think thats hung on and his asthma receded when he was 15 and he began to think about becoming a writer. He worked in the oil fields as a roustabout on Signal Hill, California during high school, during one summer, he ran an asbestos pipe-cutting machine and worked as a spray painter. As a teenager, Hill contemplated being a book illustrator and studied art at the Universidad de las Américas. Mexico was as far away as I could get any money. Aspen is the Home Rule Municipality that is the county seat and the most populous municipality of Pitkin County, United States. Its population was 6,658 at the 2010 United States Census, founded as a mining camp during the Colorado Silver Boom and named Aspen because of the abundance of aspen trees in the area, the city boomed during the 1880s, its first decade of existence. In the late 20th century, the city became a retreat for celebrities. Gonzo journalist Hunter S. Thompson worked out of a downtown hotel, singer John Denver wrote two songs about Aspen after settling there. Today the musicians and movie stars have been joined by corporate executives, as a result of this influx of wealth, Aspen boasts some of the most expensive real estate prices in the United States and many middle-class residents can no longer afford to live there. It remains a popular tourist destination, with outdoor recreation in the surrounding White River National Forest serving as a complement to the four ski areas in the vicinity. 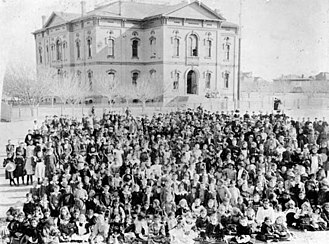 Production expanded due to the passage of the Sherman Silver Purchase Act of 1890, by 1893, Aspen had banks, a hospital, a police department, two theaters, an opera house and electric lights. Economic collapse came with the Panic of 1893, when President Cleveland called a session of Congress. 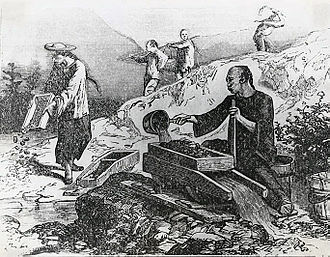 Within weeks, many of the Aspen mines were closed and thousands of miners were put out of work, after wage cuts, mining revived somewhat, but production declined and by the 1930 census only 705 residents remained. Remaining, were fine stocks of old buildings and residences. Aspens development as a ski resort first flickered in the 1930s when investors conceived of a ski area, friedl Pfeifer, a member of the 10th Mountain Division who had trained in the area, returned to the area and linked up with industrialist Walter Paepcke and his wife Elizabeth. The Aspen Skiing Corporation was founded in 1946 and the city became a well-known resort. Paepcke played an important role in bringing the Goethe Bicentennial Convocation to Aspen in 1949, Aspen was now on the path to becoming an internationally known ski resort and cultural center, home of the Aspen Music Festival and School. Glendale /ˈɡlɛndeɪl/ is a city in Los Angeles County, United States. Its estimated 2014 population was 200,167, making it the third largest city in Los Angeles County and it is located about 8 miles north of downtown Los Angeles. Glendale lies on the end of the San Fernando Valley, bisected by the Verdugo Mountains. The Golden State, Ventura and Foothill freeways run through the city, Glendale has one of the largest communities of Armenian descent in the United States. In 2013, Glendale was named LAs Neighborhood of the Year by the readers and editors of Curbed. com, Forest Lawn Memorial Park Cemetery contains the remains of many noted celebrities and local residents. Grand Central Airport was the point for the first commercial west-to-east transcontinental flight flown by Charles Lindbergh. 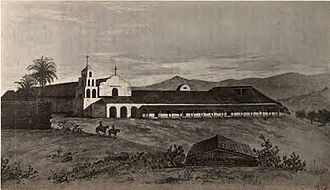 The area was inhabited by the Tongva people, who were renamed the Gabrieleños by the Spanish missionaries. 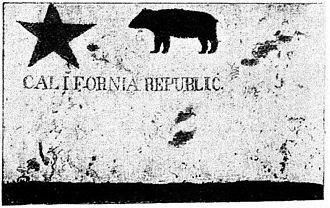 Rancho San Rafael was a Spanish concession, of which 25 were made in California, unlike the Mexican land grants, the concessions were similar to grazing permits, with the title remaining with the Spanish crown. In 1860, his grandson Teodoro Verdugo built the Verdugo Adobe, the property is the location of the Oak of Peace, where early Californio leaders including Pio Pico met in 1847 and decided to surrender to Lieutenant Colonel John C. Verdugos descendants sold the ranch in various parcels, some of which are included in present-day Atwater Village, Eagle Rock, in 1884, residents gathered to form a townsite and chose the name Glendale. Residents to the southwest formed Tropico in 1887, the Pacific Electric Railway brought streetcar service in 1904. 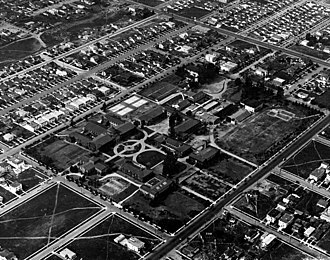 Glendale incorporated in 1906, and annexed Tropico 12 years later, Brand loved to fly, and built a private airstrip in 1919 and hosted fly-in parties, providing a direct link to the soon-to-be-built nearby Grand Central Airport. The grounds of El Miradero are now city-owned Brand Park and the mansion is the Brand Library, Brand partnered with Henry E. Huntington to bring the Pacific Electric Railway, or the Red Cars, to the area. Today, he is memorialized by one of the main thoroughfares. Kathleen Kennedy is an American film producer. In 1981, she co-founded Amblin Entertainment with Steven Spielberg and husband Frank Marshall and she was a producer on the 1982 film E. T. the Extra-Terrestrial and the Jurassic Park franchise, the first two of which became two of the top ten highest-grossing films of the 1990s. Kennedy is third only to Spielberg and Stan Lee in domestic box office receipts, on October 30,2012, she became the president of Lucasfilm, and the brand manager of the Star Wars franchise, after The Walt Disney Company acquired the company for over $4 billion. Overall, Kennedys work has included over 60 films,120 Academy Award nominations, one of her most recent projects, produced by Spielberg, was nominated for seven Golden Globes and twelve Academy Awards. Kennedy was born in Berkeley, the daughter of Dione Marie Dede, a theater actress, and Donald R. Kennedy. Her twin sister, formerly a location manager in British Columbia, Kennedy graduated from Shasta High School in Redding, California, in 1971. She continued her education at San Diego State University where she majored in telecommunications, after her employment with KCST, she went on to produce a local talk show entitled Youre On for the station for four years before moving to Los Angeles. 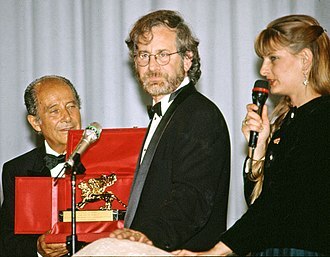 In Los Angeles, Kennedy secured her first film production job working as an assistant to John Milius, during the production of 1941, while working for screenwriter John Milius, Kennedy came to the attention of Steven Spielberg. Spielberg hired Kennedy as his secretary, but both she and he reported that she was a terrible typist who was kept on only because of her good production ideas. Kennedy was credited as associate to Mr. Spielberg on Raiders of the Lost Ark and she began receiving producer credit with Spielberg on the box-office smash E. T. the Extra-Terrestrial, which continued on most of his films for the next three decades. Following her work on the Indiana Jones films, she rose to one of Hollywoods leading producers. In 1981 she helped co-found and run the successful production company Amblin Entertainment, with Spielberg. George Orson Welles was an American actor, director and producer who worked in theatre and film. In 1937 he and John Houseman founded the Mercury Theatre, an independent repertory company that presented a series of productions on Broadway through 1941. It reportedly caused widespread panic when listeners thought that an invasion by extraterrestrial beings was actually occurring, although some contemporary sources claim these reports of panic were mostly false and overstated, they rocketed Welles to notoriety. 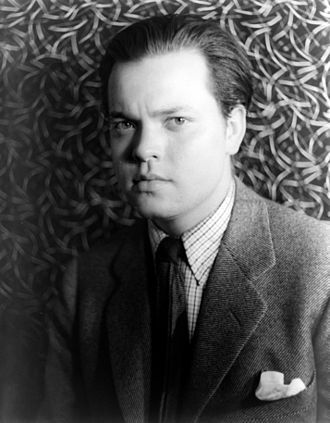 His first film was Citizen Kane, which he co-wrote, directed, Welles was an outsider to the studio system and directed only 13 full-length films in his career. He has been praised as the ultimate auteur, Welles followed up Citizen Kane with critically acclaimed films including The Magnificent Ambersons in 1942 and Touch of Evil in 1958. 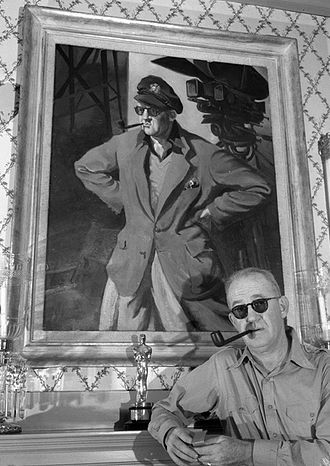 Although these three are his most acclaimed films, critics have argued other works of his, such as The Lady from Shanghai and Chimes at Midnight, are underappreciated. Known for his voice, Welles was an actor in radio and film, a Shakespearean stage actor. George Orson Welles was born May 6,1915, in Kenosha, son of Richard Head Welles and he was named after his paternal great-grandfather, influential Kenosha attorney Orson S. Head, and his brother George Head. Despite his familys affluence, Welles encountered hardship in childhood and his parents separated and moved to Chicago in 1919. His father, who made a fortune as the inventor of a bicycle lamp, became an alcoholic. Beatrice died of hepatitis in a Chicago hospital May 10,1924, the Gordon String Quartet, which had made its first appearance at her home in 1921, played at Beatrices funeral. 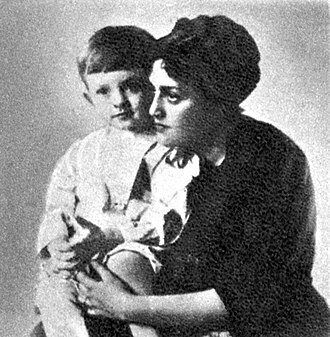 After his mothers death Welles ceased pursuing music and it was decided that he would spend the summer with the Watson family at a private art colony in Wyoming, New York, established by Lydia Avery Coonley Ward. There he played and became friends with the children of the Aga Khan, Welles briefly attended public school before his alcoholic father left business altogether and took him along on his travels to Jamaica and the Far East. Van Nuys /vænˈnaɪz/ is a neighborhood in the central San Fernando Valley region of the city of Los Angeles, California. The town was founded in 1911, and named for Isaac Newton Van Nuys and it was annexed by Los Angeles on May 22,1915, after completion of the Los Angeles Aqueduct, providing it with the water required for further growth. Van Nuys was the first new stop on the San Fernando Line of the Pacific Electric Railway red cars system, which boosted its early land sales and commercial success. 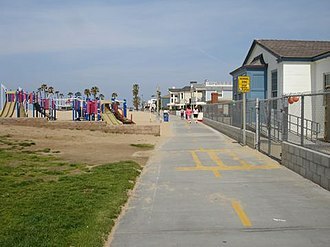 In 1991 Marvin Braude, a member of the Los Angeles City Council and this redesignated area included the community of Magnolia Woods. Some area residents had presented a petition and several original deeds that stated Sherman Oaks to Braude and they argued that the area was originally a part of Sherman Oaks until the 1960s, when ZIP codes labeling the area as Van Nuys were established. In 2014, A Great Streets project was introduced by Mayor Eric Garcetti with Van Nuys Blvd. to be redesigned between Victory Blvd. and Oxnard Street, Sepulveda Blvd. was resurfaced between Victory Blvd and Oxnard Street in May 2014. A new Los Angeles County services building is under construction on the southwest corner of Van Nuys Blvd. on February 14,2016, some 170 firefighters battled a fire at the abandoned Voyager Motel at 6500 N. Sepulveda Blvd. The 2000 U. S. census counted 103,770 residents in the 8. 99-square-mile Van Nuys neighborhood—or 11,542 people per square mile, in 2008, the city estimated that the population had increased to 110,747. In 2000 the median age for residents was 28, considered young for city and county neighborhoods, the neighborhood was considered moderately diverse ethnically within Los Angeles. The breakdown was Hispanics,60. 5%, whites,23. 1%, Asians,6. 4%, blacks, 6%, and others, 4%. Mexico and El Salvador were the most common places of birth for the 49. 8% of the residents who were born abroad—a high percentage for Los Angeles. There were 4,917 families headed by single parents, or 21. 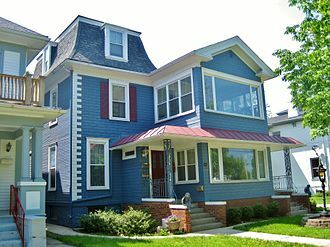 3%, the median yearly household income in 2008 dollars was $41,134, considered average for the city but low for the county. 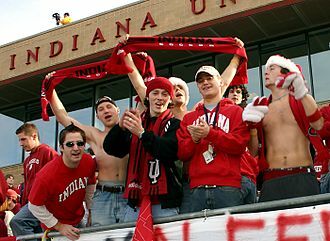 College soccer is played by teams of soccer students throughout colleges and universities. 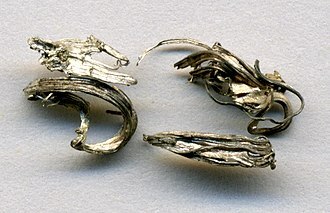 It is most widespread in the United States, but is prominent in South Korea. 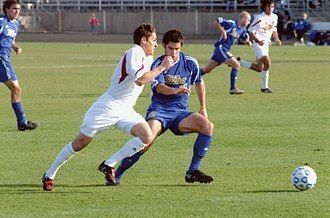 The institutions typically hire full-time professional coaches and staff, although the student athletes are strictly amateur and are not paid, College soccer teams play a variety of conference and non-conference games throughout the fall season, with the season culminating in the post-season tournament called the College Cup. The St. Louis University Billikens are the most successful team, top college players often go on to play professionally in Major League Soccer or other professional leagues. The best college soccer player each year is awarded the Hermann Trophy, College soccer is played in the fall. The regular season lasts from late August to early November, playing games against both opponents and non-conference opponents. The NCAA championship is played in November and December, with 48 teams qualifying for the playoffs, in addition to more closely matching the professional season, the changes address issues of player health and safety and of the time demands on student-athletes. The proposal concerns only Division I mens soccer, while a large majority of mens coaches and players support the changes, only a small minority of womens coaches and players currently do so. At this time, there is only the informational campaign, no formal proposal has been made to the NCAA. While similar in appearance, NCAA rules diverge significantly from FIFA Laws of the Game. All matches have a period if the game remains tied after 90 minutes. As opposed to a regular two-half extra time period, golden goal is applied, if neither team scores in the two ten-minute halves, the match ends in a draw. College soccer is played with a clock that can be stopped when signaled to by the referee for injuries, the clock is stopped after goals until play is restarted, and the clock generally counts down from 45,00 to 0,00 in each half. In most professional leagues, there is an up-counting clock with the referee adding stoppage time to the end of each 45-minute half. The following Division I soccer teams had a home game attendance of at least 2,000 during the 2015 season. The Driver is a 1978 crime thriller film written and directed by Walter Hill, starring Ryan ONeal, Bruce Dern, and Isabelle Adjani. Based upon similarities in plot elements, it is influenced by Jean-Pierre Melvilles film Le Samouraï. The film is notable for its impressive car chases, its no-frills style of filmmaking. The Driver - real name unknown - is a man who has made a career out of stealing fast cars. Hot on the Drivers trail is the Detective, a cop who refers to the Driver as Cowboy. The Player, a beautiful, mysterious woman, witnesses the Driver speeding away from a casino robbery, since the Driver has never been caught, the Detective is obsessed with catching him. Gordon suggested to Hill they make a film about a getaway driver, Hill says he wrote it as a very tight script and could not get it cast for a year and a half. I knew when I was getting ready to do the movie that I was taking a chance and this was not meant to be an everyday action movie. I was trying to do something a little more, or a little less, the script was written in a sparse, minimalist style, which Hill had first employed on Hard Times. I thought that made people read with greater intention, said Hill. 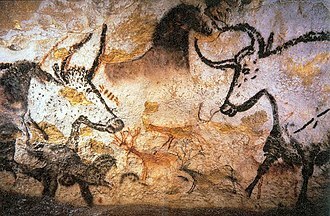 It’s spare in detail but written to dramatic effect and you could maybe capture the mind of the reader a little better. Walter Hill says he sent a copy of the draft of the script to Raoul Walsh for his approval. In the late 1970s, Britains EMI Films came under the stewardship of Michael Deeley and they began co-financing movies shot in Hollywood in association with major US studios that were aimed at the international market, such as Convoy, The Deer Hunter and The Driver. They were interested in financing The Driver provided a suitable star could be found for the lead, the role of the driver was originally intended for Steve McQueen, who had starred in the Hill-scripted The Getaway. McQueen turned down the role because he did not want to do another car thing, according to Hill, the studio went to Charles Bronson who had been in Hard Times but Bronson was unhappy with Hill. He thought I had edited Hard Times in a way that had not favoured Jill Ireland, said Hill, and I never thought he’d do it. View of Aspen from Aspen Mountain ski area. Bluesman Muddy Waters guested with The Band for the concert. 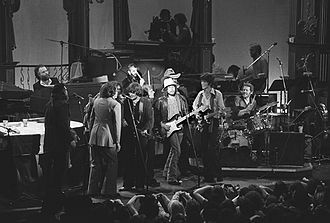 The Band, with Bob Dylan and guests, during "I Shall Be Released". Steven Spielberg and Chandran Rutnam on a location in Sri Lanka during the filming of Indiana Jones and the Temple of Doom. North Carolina Tar Heels celebrate winning the 2006 Women's College Cup. Kathleen Kennedy during the Paris premiere of The Adventures of Tintin on October 22, 2011. Drake Stadium, the former home field of the soccer teams.